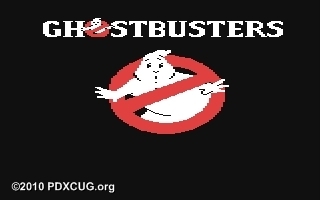 This evening's meeting was a little less typical with a lot of discussion about club-related business. 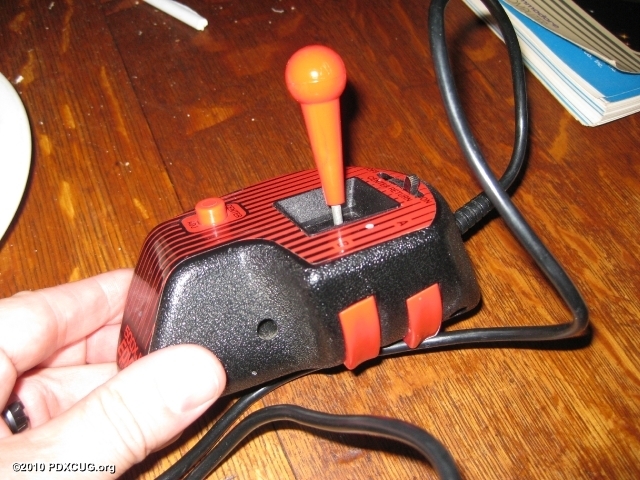 We discussed the future of the Commodore Joystick Switch and its associated plans. 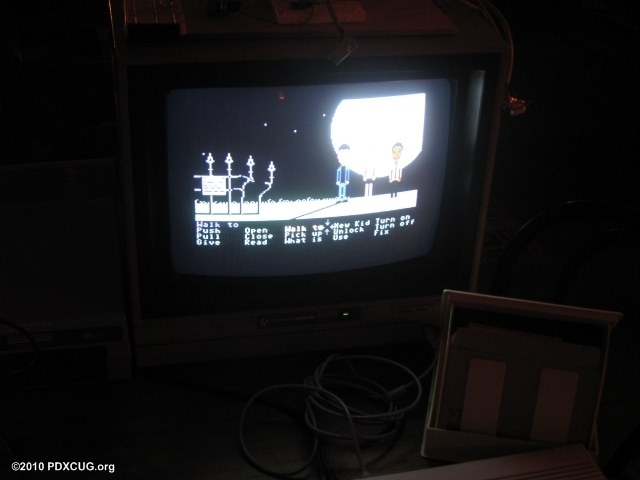 Members voiced their ideas on meeting times and places. 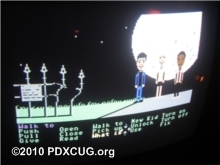 As a result, the meetings will be held once again at Sunset Lanes with an earlier starting time of 6:00 pm instead of 7:00pm. This will give members a chance to set up equipment and have time to copy disks or fix equipment while waiting for others to arrive. Here are some of the highlights of our meeting. 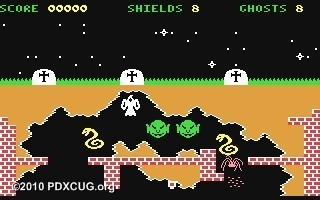 We had about 30 Commodore 64 Games to choose from - see the full list of Scary Halloween Games for the Commodore 64 that we had available. 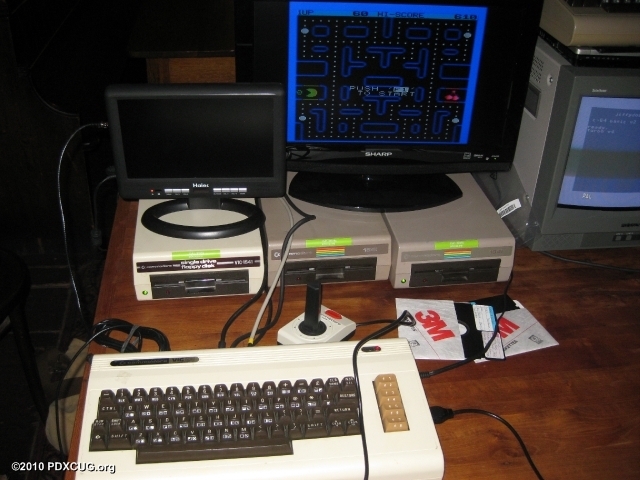 Member Ernie sets up his PAL Commodore 64 to show off Fortress of Narzod which doesn't work on NTSC machines. Fun game! 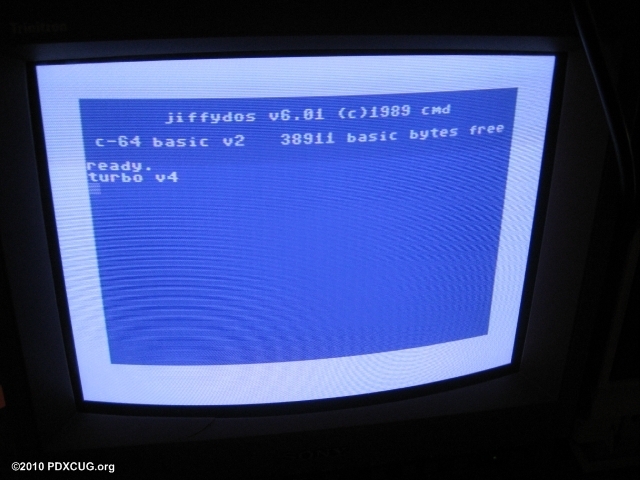 Ernie's monitor has an excellent picture - here it is, showing JiffyDOS installed. 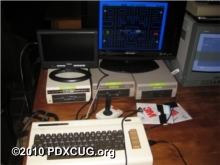 A Vic-20 playing a Pac-Man Clone. Members got to play a little Maniac Mansion, along with other Halloween games. 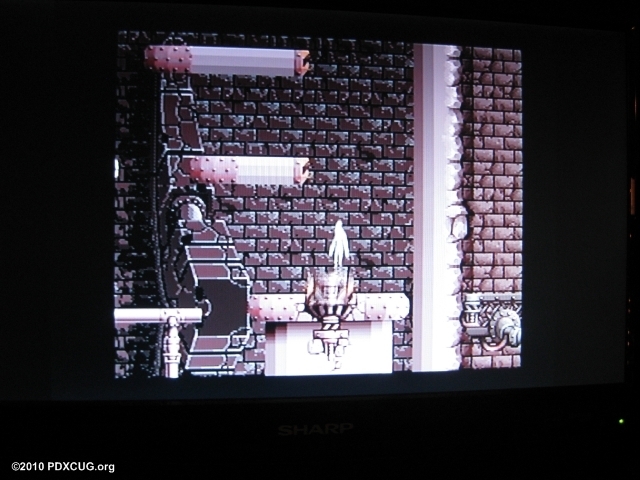 Here's a close-up of the game. 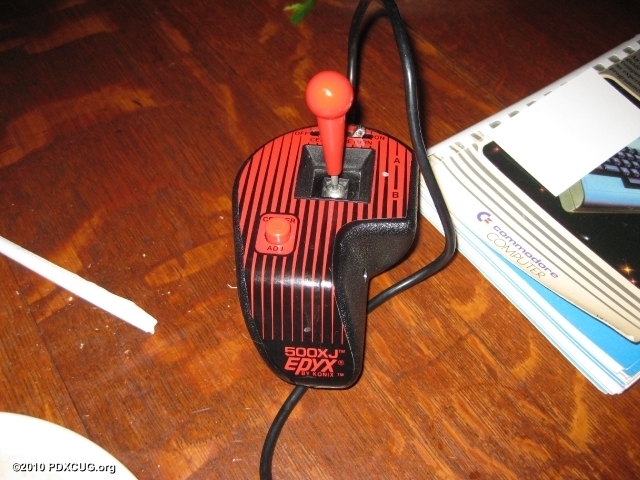 Member Agent Friday brought this cool version of the Epyx Joystick we're all familiar with. 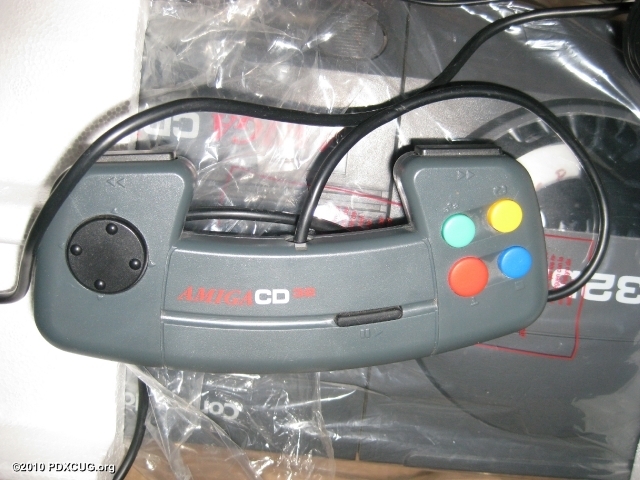 Except this one is analog. It has a switch to allow free-form analog control or a spring-loaded "return-to-center". 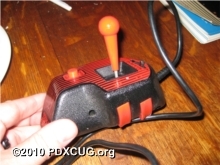 This joystick has not just one button, but two, unlike its Commodore-version brother. 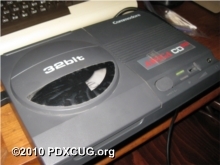 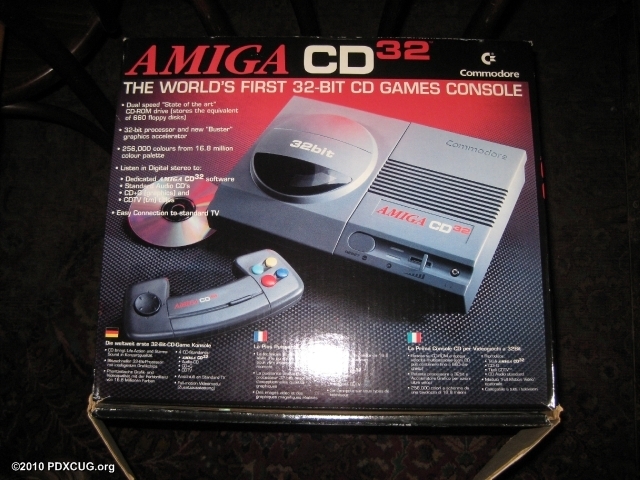 "The World's First 32-bit CD Games Console" - This Amiga CD32 system was purchased brand-new from a Commodore dealer back in the day and has been sitting in storage for years. 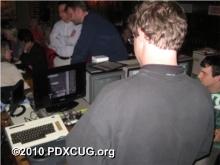 Original owner Goog brought his rare treasure to show off and share with members of the Portland Commodore Users Group. 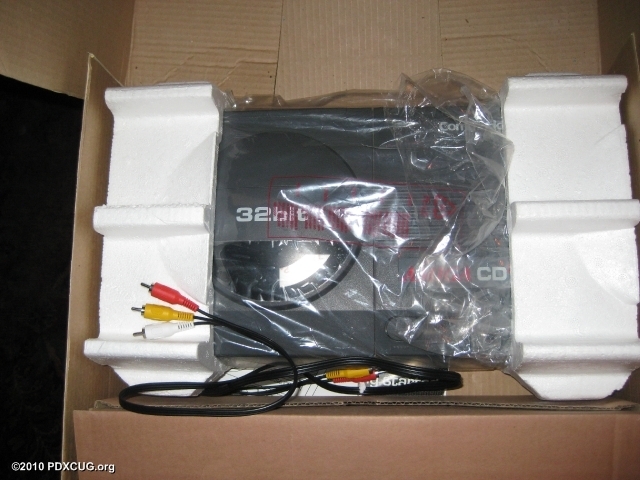 This system is so clean and new, it still has the plastic protective film over the plastic parts and original tie-wraps around the a/v cables (the ones shown are not the original, to protect the wrapping of the original). 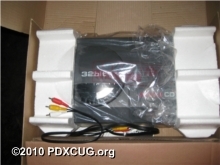 It is a fully-complete system, with all wires, power supply, controller, manual and box. 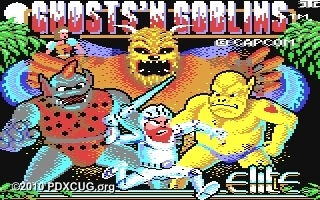 Goog brought plenty of games to show off, too, such as: Impossible Mission 2025, Trolls, Skeleton Krew, Litil Divil, Labyrinth of Time, Alien Breed, Alfred Chicken, Humans 1 & 2, Battle Chess, The Last Ninja 3, Theme Park, and many more!